Hi all – It’s been almost two months since our last update, which is back when Sally had her port surgically removed. 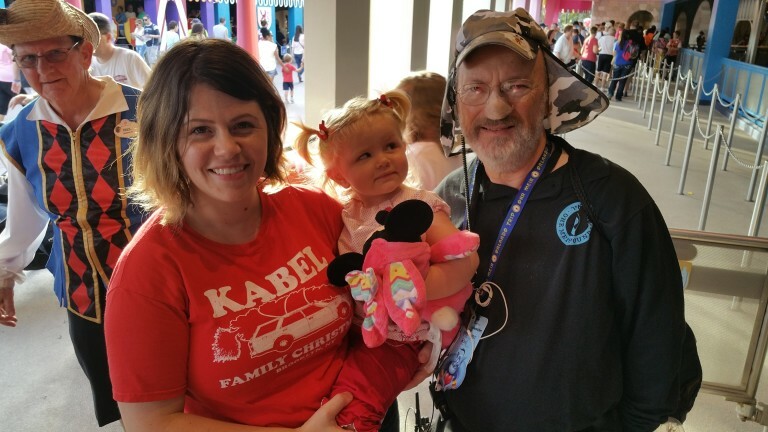 We’ve been very busy during that stretch which included a trip to Florida to see Grampa and Gramma Kabel, capped off by a visit to Disney World. It was our first real family vacation, and a much needed break from our chaotic lives over the last two and a half years. 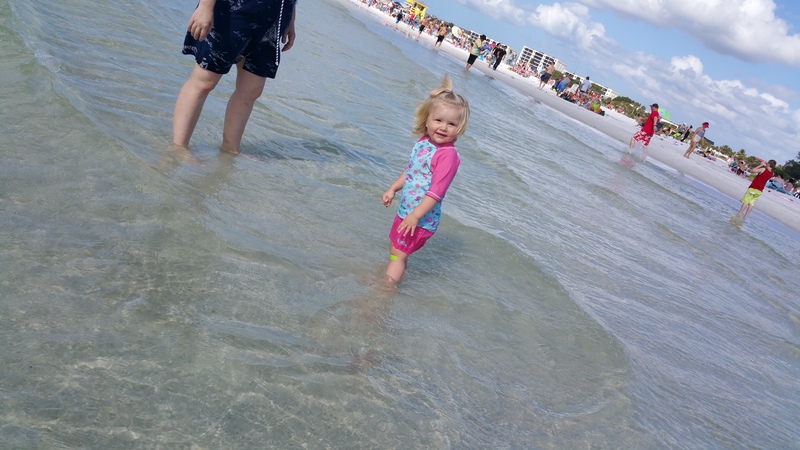 Sally’s first time in beach water, and first time experiencing waves. As we were coming off It’s a Small World at Disney World, we bumped into the head of Sally’s Leukemia Team, Dr. Steinherz! Totally random! Sally has been doing very well, continuing to progress in her development since finishing chemo in August. She loves to go down slides and ride the swings at the playground, and she prefers to walk places instead of riding in the stroller. It’s hard to believe she was still receiving chemo only five months ago. Sometimes we forget that she’s only been walking without support for that long too. 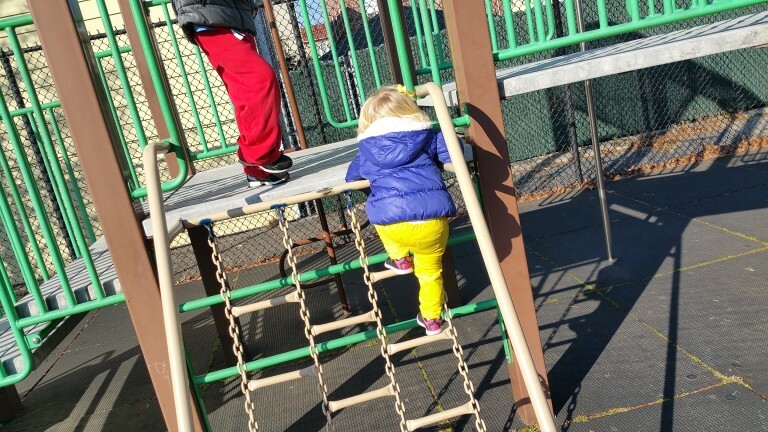 Climbing the chains at the playground for the first time. Many have asked if we’re back to normal as a family. The brief answer to that is no. Even though Sally has been off treatment, we are still working to get back to some semblance of ‘normalcy’. Nicole often gets asked if she’s back to working full time since she doesn’t have to bring Sally to MSK anymore other than her monthly appointments. In reality, Nicole is just as busy post-treatment with Sally. 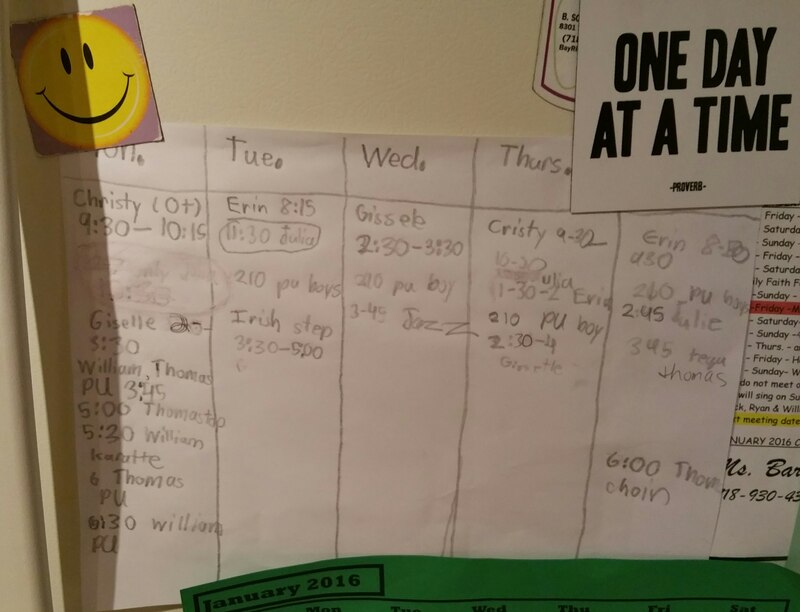 It took a few weeks to find therapists and create a schedule that incorporated Sally still getting a few naps a week and also worked with Thomas and William’s activities. Sally now has a great team of therapists in place, although gets a little hectic sometimes because of cancellations and rescheduling. We also take her to MSKCC once a month to check in with her therapy team there. In addition, we are working extremely hard to get Sally eating again. If you recall, Sally stopped eating shortly after her treatment started at 10 months of age (she had only just started eating baby food three weeks earlier), and did not eat anything by mouth for almost two years during an important period for developing eating skills. Sally did maintain some level of breast feeding which was very helpful. While nursing, Nicole often simultaneously tube fed her as a way to associate nursing with a way to satiate her hunger. All food and medication were delivered via a feeding tube into her stomach. During treatment, her oral muscles did not strengthen as with typical children. She lost the reflex to chew on her back teeth, to alternate food from one side of the mouth to the other and Sally never learned that eating food overcomes hunger. 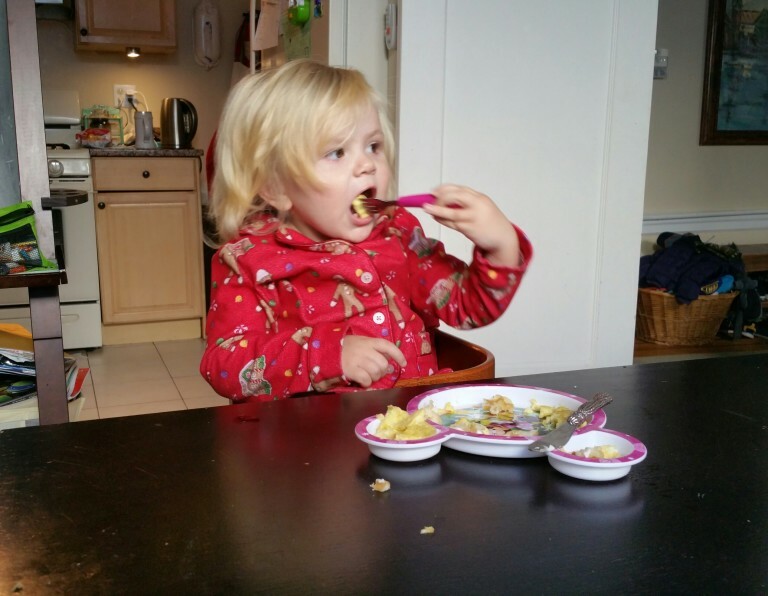 Now that treatment is over, we are trying to teach her body to eat which is a slow and arduous process, especially with the stubbornness of a “threenager”. After 39 months of expressing milk Nicole decided to move on and focus on table feeding in November. This has been very stressful, every meal is a battle with Sally in getting her to eat and teaching her that eating makes her feel better. Most meals consist of us sitting with her at the table for an hour in which she slowly eats an egg, or three organic chicken nuggets, or some broccoli and strawberries. It requires a ton of patience, and even some bribing (“Sally, if you take a bite I’ll wear this plate as a hat!”). We made some progress early on getting her to swallow, and have found some foods she likes. But for the last few weeks we’ve hit a plateau, where she’s not eating any more or doing it with any less urging from us. Her feeding therapists expect these types of delays and reactions given her age and all she’s been through. At the moment she is half fed through her tube and half table fed. Considering where she was a few months ago she has made good progress. Eating her egg over the course of an hour. It certainly is teaching us patience, and in a good way forcing our family to sit together for meals as we don’t get up until Sally is done. Some have suggested we should just remove her feeding tube and force her to eat. There’s a couple problems with that which include the fact that she still needs to understand that eating food will satiate her. Until she makes that connection, she’s not going to eat enough to nourish herself. Sally also needs to be able to chew efficiently and have the strength to do so for three meals a day. She’s at a decent weight right now, if anybody remembers Sally’s weight was low at times over treatment due to all of the vomiting and extreme diarrhea. At our last checkup we received a printout and realized she was below the 0% percentile for height and weight in her age group during treatment! On the bight side, she has now reached 20th% for height and 75th% for weight. We are so grateful she is growing, gaining weight and reaching new milestones every day. If we remove the tube before she’s ready we risk her weight significantly dropping, god forbid she’s underweight and relapses and we have to start treatment again at a low weight. Not to mention Sally still takes several medications that we wouldn’t be able to deliver orally. So removing the tube is not happening until she’s able to nourish herself by mouth. 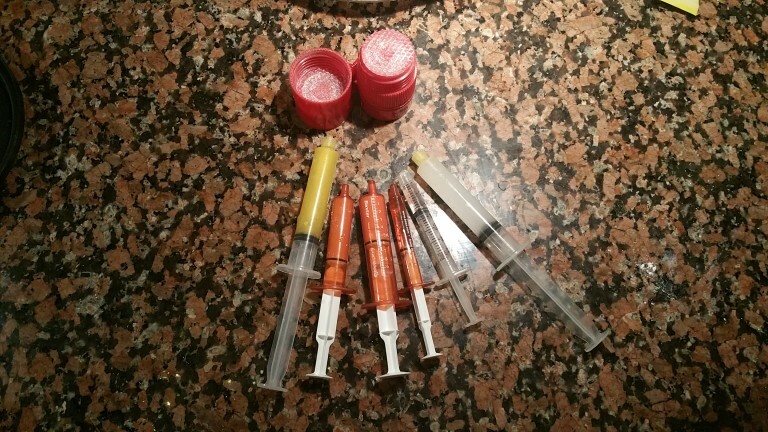 She gets these meds and vitamins every single morning. So although Sally progresses in some areas, she’s still challenged in others and is not ready to be away from us for long periods yet. Trust us, nobody will be happier than our family when she gets to that point, but is going to take time. We are still coming out of our own shells as a family. We were driving into Manhattan recently to spend a fun family day together when Thomas remarked that he was feeling sad. When we asked why, he replied that we were on the highway towards Sloan Kettering and he was thinking about all the trips we made there and what Sally went through. The boys grow worried when Sally shows any sign of not feeling well. Secretly, so do we. The lingering marks are daily reminders of what Sally (and we) endured. Nicole and I sat and talked about our feelings on New Year’s Eve, about how we hoped 2016 would be the first full year for Sally without chemo. We both acknowledged our anxiety over Sally’s potential for relapse, thinking back to our decision a year ago this time to scale back her treatment after the seizures, extreme GI issues and broken bones. It made a world of difference for her considering her body had taken all it could, and we’d never second guess that decision, but you hope it doesn’t one day come back to haunt us. What’s very frustrating is that we constantly have to educate and battle to get Sally the support she needs, whether it’s NYC’s Board of Education, William and Thomas’ doctors, or sometimes even Sloan Kettering itself. We continue to watch kids we know relapse, and some pass away. It doesn’t get any easier. We do our best to look forward, be positive and move on with our lives, but deep down we’re still unsettled and scared. We can honestly say that we treat every day with Sally as a gift, and don’t take even one for granted. Here’s to 2016 being a good one for Sally and our family, and for all the cancer families out there. Please keep Sally in your thoughts and prayers. I continue to think about and pray for your family. Sally has a gorgeous and smiling face. I just love seeing how she is doing and all her pictures. May God protect and watch over that little angel of yours, well you have 3 angels, William and Thomas too! Hope 2016 is way better than 2015! Anytime it gets too hectic for Nicole to cook, I would love to order your family a meal every now and then. Don’t hesitate to ask, whether it be by email or cell phone. Tripledhurt@msn.com, 314-614-1973. Sending lots of love and prayers for your whole family. I understand how crazy life can be when you have a sick child….I’m so glad that your sweet Sally is doing better. Hopefully one day your life will be normal again. Sally was always a beauty but she is now becoming the beautiful toddler she should be. How lucky she is to have the family that she has and how lucky you all are to have Sally. I love seeing her picture, walking to school with her brothers, at the park, etc. I will continue to pray for Sally and all of you. Stay strong!!!!! Sally is a warrior she amazes me every time I see her!! !i will hold her in my prayers each and everyday❤️??????????????????????? I know its a long,hard road….that you have been on…and are still on…just know so many are praying for Sally’s continued health and upward milestones. We keep your daughter and family in our prayers. Your journey and feelings hit home–although for different reasons. Our son was born 3 months premature–spent 3 months in the NICU and 6 months on oxygen. 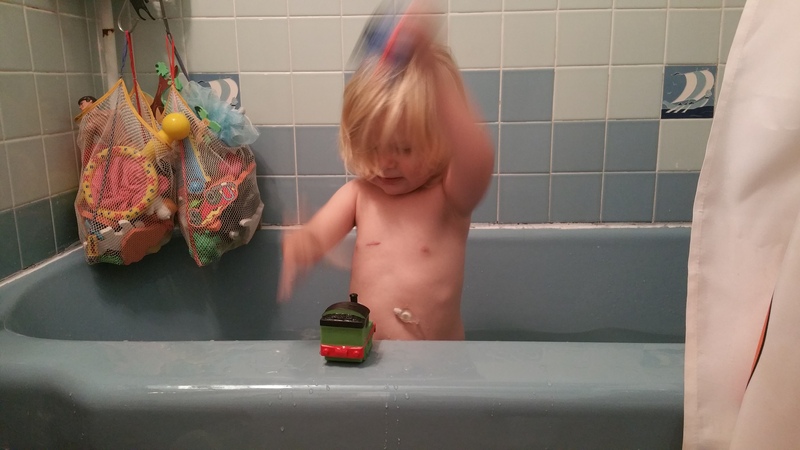 He was diagnosed with CP at 18 months. We have spent the last 15 years filled with therapy, surgery, recovery and silent fear. We didn’t know how to function out of a world filled with CP and therapy and doctors. Just when we felt like things were setting down, my husband was diagnosed with a rare form of sarcoma. He has had 3 relapses, 7 surgeries and after 3 years–a clean scan. He will finish this round of chemo and hopefully another clean scan so we can move past the world of chemo. I’m not comparing our journey to yours–but we understand the loss of a child’s right to a “normal” child hood. We understand the all encompassing world of doctor appointments and hospitals. We understand the feeling of holding your breath with ever sniffle, cold or bad day and as much as we are ready to live in a world free of CP and Cancer we don’t quite know how to live a “normal” life without these things. Your family is special and amazing. We will continue to pray for you all! Matt and Nicole, each day, your life will be ‘new normal’. For some reason, God has chosen the two of you to be parents of these three angels. He will give you the strength you need to take care of them and all of us will keep you in prayers to support you. Matt, Nicole, Thomas, William, and dear Sweet Sally Sunshine. May God continue to bestow upon you His strength and grace to keep faith and hope always within your hearts. Focusing on Sally’s gains, the positives in your lives, and continuing to surround yourselves with upbeat people of hope will always help you put “one foot in front of the other”. I am most grateful for your updates and you all have been continually in my prayers. Your journey is an inspiration to me and although some of Sally’s and Blake’s (our 2 1/2 yr grandson) major health issues are different they share many other health issues. Thank you once again for your updates through your posts…honestly, they are a reminder that God will provide, His timetable is not always in sync with ours, and that we need to take one day at a time. May God hold you all gently in the palm of His hand. You are an amazing family and I will pray for your strength and healing.